'Boring' Singapore City Photo: How Big Is Your Feet? Almost every mall in Singapore is have some sort "fashion show" as the Singapore Fashion Festival is currently running. This was spotted at noon today at Vivo City. 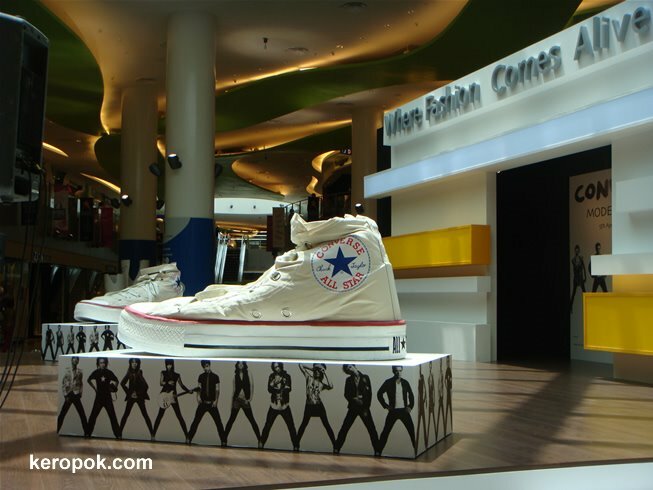 A fashion show sponsored by Converse. The show has not started, but I just happen to walk by. That shoe is so so big! What is your shoe size? i really like this photo cos the angle is just right and you can see the words "where fashion comes alive" which suits the theme of fashion week! by the way, i'm thinking of going to singapore to buy a camera this summer..do u know which stores are better(reasonable price and good service)? thanks a lot! Are you getting high end sophisticated cameras or just point and clicks? thnk you for the pics!